Your listening skills will determine the chances of success you have in learning English (or any language for that matter). Listening skills are at the heart of learning to speak another language. In fact your English listening skills will determine the level you can reach in speaking. So, if you want to improve your speaking, learn the 5 step process below which will do just. Once you master it, it will indeed make all the difference. Many students understand this so they look for listening exercises to help them improve their listening. Teachers also understand it so they give their students listening exercises to do. Listening can have different purposes. In this post I will concentrate primarily on one; the use of it to improve your speaking skills. Typical listening exercises may help but for the most part they don't provide the kind of experiences that learners need so that they can become better listeners AND speakers of English in real life. Listening exercises that you usually come across are like bouncing a basketball in your backyard; they can only get you so far. Until you start playing with others, your skills will not really develop to the level you need to play a good game. The reality is that learners need to develop the skills necessary to improve their listening whilst they are listening to others, to the TV, etc. Without this, language learners can easily get stuck at the level they were when they left their classes, or just improve marginally. I would like to relate here something that happened in one of my classes not that long ago. A middle aged student who had recently joined an existing class I was teaching had been struggling with her listening. She just seemed to miss things talked about in the class that even those weaker than her picked up without too much effort. somehow to avoid this. Maybe because she didn't give enough value to this kind of interchange. She may have been waiting for the "real language learning exercises" which she was used to. I said to her that it is important that she listen to everyone in the class, not just me. I could see the lights go on in her eyes, maybe because my classes concentrate so much on the speaking in the class. She said, "I need to pay more attention to the students" in a tone indicating she just had an ah ha moment. I said, "Precisely. That will give you a lot of opportunity to use your ears to listen to all kinds of things. This will help you in many ways. If you don't understand something, you need to say so." I could see the realisation sink deeper into her mind. I have seen students in my classes improve their listening, through becoming increasingly involved in the class, not by doing listening exercises. I seldom if ever do formal listening exercises, as they are artificial. They teach students to subconsciously to think that they can improve their listening by doing these exercises. Well they might! But how realistic is that? What will they do once they leave the class? There is no lasting way left with through which they can improve their listening I would suggest (except for the few who already know what to do). In reality, listening can improve when you pay attention (as the student so clearly put). It is better to train yourself to pay attention to everything you are listening to rather than isolate that activity to exercises! This is common sense...but as has been said before...that is not so common! The reality is that we can value other things so much more than listening that our listening can actually suffer. Maybe because we have too much on our plate, or that we are highly goal oriented, or maybe just too self absorbed. Hence we might pay more attention to achievements, to tasks, to what we are thinking rather than to giving our undivided attention to listening to others. Whatever the case, the way to improve your listening is to practice it with full attention to what others say AND to what you say. 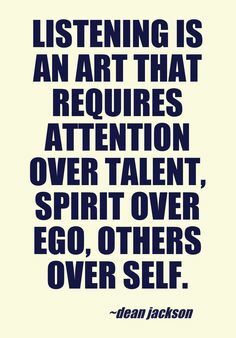 If you have allowed your listening powers to degrade some, then it will take some focussed practice to revitalise it. I don't really like the word practice as it seems to suggest exercises. The reality is that it is FAR better, for the reasons I have mentioned, to apply yourself in your life. If this is not possible, find areas that are close to it...possibly listening to songs, movies, etc. The best kind of listening is of course is when you speak with others. That is what I am going about below. I would like to tell you here about a 5 step process that can really help you not only to improve your listening but also your speaking. Now wouldn't that be a bonus! Work at it for a while and you will see the difference it makes to you in both areas. Choose something to listen to that you will be fully engaged in. Fully! In the same way you would be listening to something that could change your life. That fully. If you are not engaged in what you are listening to, improvement is not going to happen. Now listen. It is your choice whether you are going to focus on the meaning, on some part of the pronunciation or the structures being used. Most people choose to listen to the meaning, and ignore the other two. However you can choose to just listen for how the speaker is talking about the past for example. The more clear you are in what you choose, the more you can learn. When you speak, listen to yourself. Listening to yourself carefully ( not with judgement but with observation) is really important as it will tell you how you speak. Not how you think you speak! Here, do the same as in step 2. You can choose what to focus on in your listening. You can't effectively listen to everything. By choosing to focus on one thing, you will concentrate your listening and your attention. That is what is required if you want to improve anything. Where possible it is more effective usually to listen in yourself to the same thing you listened to in the person you are talking to. Sometimes of course it is not. But if you were engaged in your listening, looking for something (eg as in the examples above,) it is far less likely you will not be able to recall them as needed, especially if that is your focus over a number of days. Now compare what you found. Obviously you can't compare everything. That is why it is important to be focussed as you can in choosing something definable in step 2. Your aim in your speaking is to use what you hear/listen for. This comparison "forces" you be active in your listening. Just saying I listened to him is not enough. You need to work towards making statements like, "He said XYZ." I said "XiYZ". Then from that comparison you might need to find out the cause. Maybe both are ok. Maybe only his is ok. This may take a while...or you just might realise it. "Oh yes, of course I have to say that". Here is where, the next time you speak, you need to be able to reduce the difference ( if there was one) between what you heard the other say and what you heard yourself say. Once you can do this, you will know your listening is improving. This 5 step process for improving your listening requires you to learn to do things a little differently. It is more important that you learn to use your listening, not whether you agree or disagree with what is said in a conversation. Once you get into a conversation where your opinions matter, it is easy to get lost in it and forget the purpose of your listening. That is TO IMPROVE YOUR SPEAKING! Simple as that. 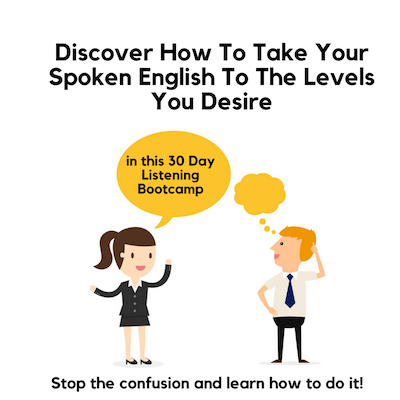 A 30 Day Online Listening Bootcamp will soon be available to those who would like to work at this more intensively, so they can learn to master their listening in a way that will make their speaking improve. What I have described in this 5 step process here is a key strategy that can help to improve your English listening skills. This is a practical way that once you implement, it will not only improve them but also improve your speaking skills. Something every language learner wants.